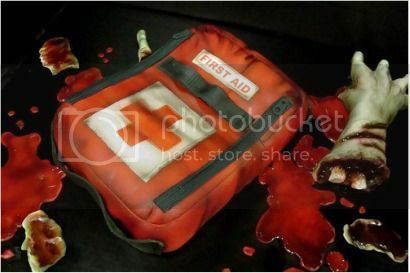 Debbie Goard of Debbie Does Cakes (see her fantastic Darth Maul cake and Millennium Falcon cake) has once again knocked it out of the park with this Left 4 Dead birthday cake featuring zombie appendages and a first aid pack from the game. Of course, when I speak of “the park,” I’m referring to the game of messily-bloody confectionery baseball. Obviously. The health kit was a chocolate cake. The hand was made of rice krispie treats.